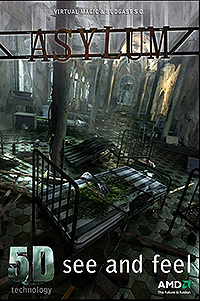 Asylum 5D movie is a virtual trip through a gloomy madhouse. Using FPP (First Person Perspective) viewers pass through a number of rooms and hospital corridors, filled with horror where paranormal activities are hiding behind every corner. The dark atmosphere of the movie gives, you a truly horrifying and nerve-wracking thrill! See it, feel it, smell it – make the most of all your senses! Matrix Technology company is the co-producer and owner of the film “Asylum 5D”. Matrix Technology Sp. z o.o.